PED: Simbali (f.) [cp. Vedic shimbala flower of the B., cp. Pischel, Prk. Gr. ? 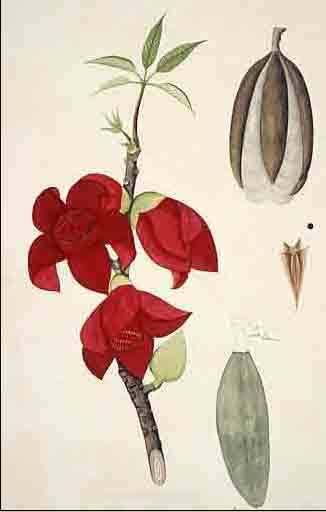 109] the silk-cotton tree Bombax heptaphyllum J I.203; III.397; Vism 206; DhA I.279.— vana a forest of simbali trees J I.202; II.162 (s. — pālibhaddaka-vana); IV.277. sattisimbalivana the sword forest, in purgatory J V.453. SN 1.11.06, n.2, Mrs. Rhys Davids: The Simbali Vana, Silk-cotton-tree Wood (Bombax Heptaphyllum, according to the Wilsonian botanical lore incororated by Childers in his Dictionary) stood on the slope of Mt. Sineru, and was the abode of Garuḍa or roc-birds.